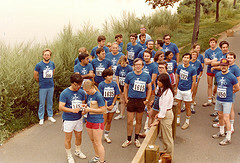 50 Years of AAPM -- Over 25 Years of Gammex-sponsored fun runs! This year the course will start from the Southeast corner of Memorial Park, run along Allen Parkway and across Waugh bridge, allowing runners to see downtown Houston's skyline. Deadline to register is June 27. There is no on-site registration for this event. Registered participants must come by the AAPM meeting registration area in the convention center on Monday, July 28, between 10:00am and 2:00pm, to sign a waiver and pick up a race number and t-shirt. Thanks once again to Gammex for sponsoring this event. 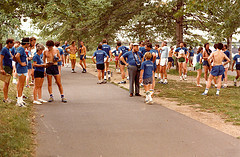 Below are photos to instill fond memories of that first sponsored run in Boston, 1981. All tours depart from the Hall D Entrance, ground level, G.R. Brown Convention Center. Register for tours through AAPM on-line registration, beginning March 19. Deadline to pre-register for tours is July 14. Tour tickets may be available on-site, near the Companions' Welcome Center on Level II, if tours have not sold out. Space Shuttle Mock Up - a duplicate of the mid-deck and flight deck of the space shuttle. Try the "Land the Shuttle" simulator. Moody Gardens is a 142-acre recreational and educational facility in Galveston. A massive 40,000 sq-foot Rainforest Pyramid recreates the jungles of Asia, Africa and the Americas. More than 1,700 species of tropical plants, fish and exotic birds are featured. The Butterfly Hatching Hut allows visitors to watch butterflies emerge from chrysalises and flutter into the Pyramid for the first time. Admission to the 3D IMAX Theater is included, as well as admission to the newly opened Aquarium Pyramid. The aquarium houses thousands of sea creatures from North Atlantic seals to native species from the Caribbean Sea and South Pacific coral reefs. Lunch is on your own. Houston's best shopping can be found at Rice University Village and The Galleria. In Rice University Village you'll find one-of-a-kind shops interspersed with more familiar names; from The Iowa/Guatamala Store (quilts and hand-crafted items) to The Bead Shop. Plenty of eclectic cafés and restaurants are available for lunch on your own. The Galleria has four anchor stores and over 300 specialty shops. Look for Neiman-Marcus, Macy's, Saks Fifth Avenue, Tiffany's, Lord & Taylor, and Nordstrom's, plus fun boutiques and restaurants. On Monday, July 28 a reception will be held in honor of AAPM's Charter members, 5:00pm-6:00pm, just prior to the Awards and Honors Ceremony in the convention center. Honor our past, by chatting with the members responsible for creating and growing the profession. Refreshments will be served. Cash bar. Tickets are $14 per person. Please note that this ticket is included in some registration categories. Tickets may also be purchased on site at the Registration counter at the George R. Brown Convention Center. The American Association of Physicists in Medicine will honor AAPM award winners during a ceremony followed by a wine and cheese reception on Monday, July 28. Please remember your tickets. How many of us remember the 50’s and the early days of AAPM? Before the gala, chat with friends and listen to music from the 50’s. If you can jitterbug or swing, show the younger members how it’s done. Ticket required; please note that this ticket is included in some registration categories. Place your ticket in front of you when seated. Wait staff will accommodate your meal request. Unfortunately, we cannot guarantee last-minute meal requests. After dinner and Anniversary cake, you’ll need to get up and move! Infinite Groove is a 10-piece Houston band full of energy. The dance floor is calling, whether you prefer a top 40 hit, Calypso, Jazz or Swing. Prefer a quieter venue for celebrating? You’re welcome to stay in the Lanier Grand Ballroom to share conversation with old friends. Photographers from the University of Texas M. D. Anderson Cancer Center (UTMDACC) will be available from 6:00pm - 11:00pm to capture all the special moments of the Night-In Golden Anniversary Gala Celebration. All guests will have the opportunity to have individual photos taken without any obligation to purchase in Room 230 just a few steps away from the Ballroom of the Americas (Level Two) where the Pre- and Post Receptions will be held. When is the last time you had your photo taken with your significant other, family members, friends or classmates? All photos will be posted to the AAPM website after the event for purchase. The photographers at UTMDACC have a reputation for doing outstanding work. Some parents may wish to make child care arrangements. Below is a list of local child care options in the Houston area. Please note that none of these services is affiliated with, or endorsed by, AAPM in any way. Parents are encouraged to check references. In recognition of 50 years of companion support, AAPM will host a Companions' Reception in Room 344 of the Hilton Americas. Refreshments will be served. Links to Exhibitor Sponsored Events are posted here as a service to our exhibitors. There is no endorsement implied by AAPM. Only companies officially exhibiting at AAPM '08 may submit event annoucements to be posted. To have a link to your event announcement posted here, send the url to Karen MacFarland.